In 2012, the Standing Committee on Aboriginal and Torres Strait Islander Affairs tabled the report entitled “Our Land, Our Languages“. A key finding from this report was that language is inseparable from culture, kinship, land and family and is the foundation upon which the capacity to learn, interact and to shape identity is built. 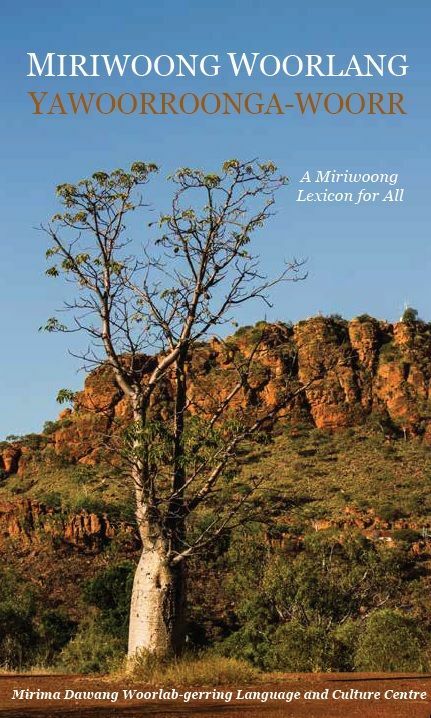 Through the publication of ‘Miriwoong Woorlang Yawoorroonga-woorr’, or ‘a Miriwoong Lexicon for All’, MDWg is continuing to revitalise and provide the community with much-needed access to the Miriwoong language. After years of research, documentation and consultation with Elders, 1400 words have been verified to publish “Miriwoong Woorlang Yawoorroonga-woorr” the first ever public dictionary in Miriwoong language. Detailing Miriwoong to English and English to Miriwoong, this dictionary was compiled to be used as a tool not only to strengthen the Miriwoong language by increasing its use among its speakers but for people that work, live or interact with the Miriwoong population. The dictionary is one of many resources published by MDWg to assist in the revitalisation of the Miriwoong language that will ensure that the Miriwoong community’s sense of identity and pride in culture is not lost. Language Workers at MDWg work tirelessly to teach Miriwoong, to record radio programs in the Miriwoong language and to publish bilingual audio-books that allow the community to reconnect with their language and culture. Miriwoong Woorlang Yawoorronga-woor (pictured below) is now available for $12. Please send an email to admin@mirima.org.au if you would like to purchase a copy. All funds raised will be used to continue to deliver programs designed to revitalise, preserve and document the Miriwoong language. Next Next post: MDWg wins at the East Kimberley Aboriginal Achievement Awards!